GIVEAWAY DAY 9!!!! To celebrate the launch of our new forums we will be having 100 DAYS OF GIVEAWAYS! 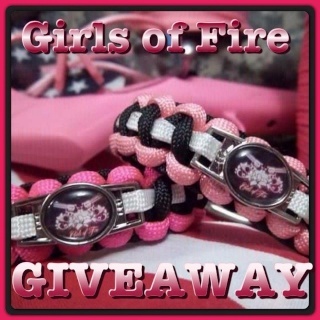 In addition, today’s Giveaway comes from a gentleman who is a longtime supporter of ours here at Girls of Fire. He is truly one of the NICEST people to work with and is always willing to get involved and make a difference. He has some very unique products in that they are not just appealing to the eye…they also have a message. 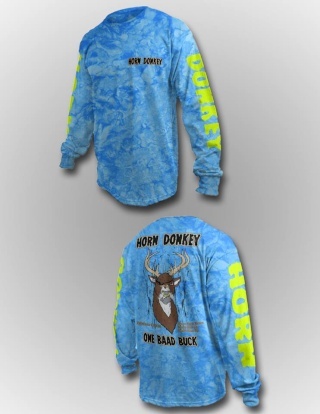 Today he is generously gracing us with one of his long-sleeved T’s in your choice of Camo or Blue…sizes L, XL or 2XL only. His shirts, decals and hats are adorned with one mean looking buck…but there is a story behind the image. 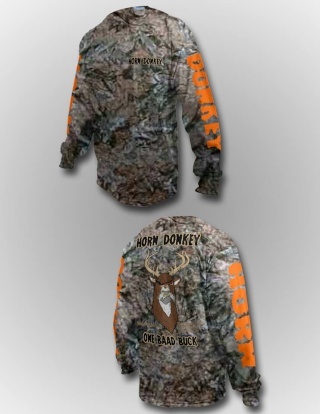 Name: “Horn Donkey” is a name given to a mature whitetail buck deer by the “Old Timers. Don’t forget the characteristics of a donkey, stubborn and full of tenacity. ONE BAAD BUCK… It speaks for itself. The image is a War horse of a mature whitetail buck deer. A true warrior to life’s obstacles, had his eye poked out, busted nose, and ripped ear, but he never gives up, he is still scratching and clawing. Credo: Never Back Down, Never Give In, Never Give Up, Respect the code and you will persevere and win. Objective: Anyone who wears a Horn Donkey product will feel empowered to concur the major hurdles and challenges that we face, they are more abundant today, than ever before. Stand steadfast. Scripture: Ephesians 6:10-18 Ties it all together... https://www.facebook.com/pages/Horn-Donkey/151499551587152?fref=ts Please help me to show him our appreciation by stopping by his page and giving him some Girls of Fire love! 2. Share the news of our giveaway by posting this link http://girlsoffireusa.forumotion.com/t123-giveaway-day-9#395 in the status on your FaceBook page. These are seriously cool shirts!! Nice T's!!! I would love the blue. I will be going back and looking for gifts for the family!!! Love my Girls of Fire sticker. Now to find JUST THE RIGHT spot for it!!! thanks for the link to a new page! Love the shirts!! Thank you for giving us a chance to win! I want the blue one.